Thanks to everyone who have viewed this piece and those who deemed it a worthy item for their personal collection. Thanks to Doublelayer for her suggesting it and Cmptrwhz for sponsoring. I like the architectural quality, but I think the eye-catching power of this piece might be increased if the main spiral was off-center instead of right in the middle. The secondary spiral does some to balance it out, but not enough to my eye. Thanks for ing and your constructive comments. This image was a challenge to frame. When I tried off center arrangement the vertical elements near the borders become overbearing to my taste and/or some undesired elements became in view. Your comments and suggestions are welcome on my more recent pieces. Thanks again. You are very welcome! I will look at your gallery, I ran across this pic in a spiral feature I chanced across. Thank you... Nice of you to leave a comment. The depth is fabulous on this piece. I love the geometric construction, the bevelling and hard metallic feel. Fantastic work. Thanks for your kind complements your Night Pod UF image [link] really caught my eye. Thank you very much. You have an awesome photo gallery you must be very proud. I used to own a white '67 Pontiac similar to one you have in your gallery. You're welcome and thank you. I wish I had owned a 1967 Pontiac like the one in the picture. I had a '73 Le Mans that was a real POS. Not the best car I ever owned. and congrats on the DD! Thanks - I like your "Wind" image very much. Thats really cool! =] Great job. Thanks I like your graphics! It's a really fun, hypnotic piece. Thanks I used to doodle a lot too. You should give the Ultra Factal software a try I think you'd find it rewarding. I like something about your Blakkoet Concept... mostly the face. But I'm really not an art critic just know what I like. Really cool looking. All of the angles and downward-like spirals; seems like you can get lost in it. Makes you sit and look at it for a while. Thanks - I got the same feeling when it popped out of some discovery work I was doing so I kept going with it. Glad you liked it. congrats on the DD and this is just an amazing piece of work . Lois - thanks for the complement. Your floral photography is very beautiful. thanks so much. that means so much to me. love this piece of work and the other one you gave the link to. you are just an amazing artist .. Thank you for the very kind words, perhaps you note will lead me to greater appreciation for poetry. Hey thanks. 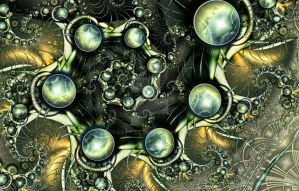 I like your Dreaming Fractals III. Thats a great complement thanks...I had to Cre8andDestroy a lot get it done. Take care! What formula is that? I don't think I've come across that one yet. Thank you very much....I like your Fire in the Sky!! Thank you. Your photography is incredible. Congratulations - this is excellent! Thank you very much, just a bit lucky. Thank you very much and I like your UF gallery very much. congrats on your DD for this very cool fractal! Thank you very much for taking the time to leave a comment!! Congratulations on the DD! This image is outstanding with incredible depth.